Though we love them unconditionally, caring for our pets isn’t always easy and we want to give them the very best we can. Spending on pets has more than doubled in the last 15 years and in 2017 alone, over $70 billion was spent in the US on pet care, including everything from veterinarian visits to cat treats to squeaky toys. But there’s some new additions in our furball’s shopping list - pet tech. Ranging from medical care tech, exercise, entertainment, and even communication, pet tech has become a widely popular way to give our pets a better life. In much the same way us people use the convenience of tech and home IoT devices, our pets are starting to get a slice as well. Microchipping was among the first pieces of futuristic pet tech tech and many pets today walk around with the ubiquitous RFID implant. Traditional microchips in pets are not exactly tracking devices and are only meant for identification purposes; reuniting owners with lost pets, helping animal shelters stay organized, and all around keeping pets safe. But the demand for reliable GPS pet tracking has prompted new tech to energy. The Whistle 3 Pet Tracker and Activity Monitor is a GPS device for your own pets that sync directly to a smartphone. Especially perfect for dogs and cats who somehow find themselves outside, lost, or in otherwise precarious situations. Though it seems they can hardly agree on anything, boomers and millennials can put their differences aside when it comes to one thing: how much they love their pets. Animal lovers, young and old, are far more likely to splurge on treats for their pets than they are to splurge on themselves, but millennials rely on tech to help care for their pets more than any other demographic. For the average American, the demands of daily responsibilities can take up valuable time we could be spending with our pets; between work, chores, and everything on between pulling our attention we can be left with just a few hours to spend with the people (and pets) that matter most. When we can’t make it home in time for dinner, the Petnet Smart Bowl can pick up the slack by weighing, measuring, and serving out the right portions of food at the right time. For cats in particular, the self cleaning, self flushing CatGenie litter box is perfect for any picky feline. This spaceship-like device helps keep a litter box clean and fresh thought out the day even in multiple cat households. In the midst of long days stuck at work, school, errands, and other responsibilities, wouldn’t it be nice if we could glance at our phone and see our pet at home? The Furbo Dog Camera utilizes two-way cameras allow for remote viewing and communication with your pet from anywhere. As a direct virtual link, you can ensure peace of mind for the safety, activity level, and comfort of your pet especially on long days away from home. Many cats, especially indoor cats, are prone to obesity and getting a lazy cat off the couch sometimes ends up being a full-time job. The FroliCat Bolt proves irresistible to event the most sleepy kitties, prompting valuable exercise, entertainment, and cat-focused intellectual stimulation. Even birds get a piece of pet tech with the Mimic Me voice recorder that captures words and phrases to play back for a curious bird to learn and repeat. The 393 million pets in the US today are more than that - they are members of the family. 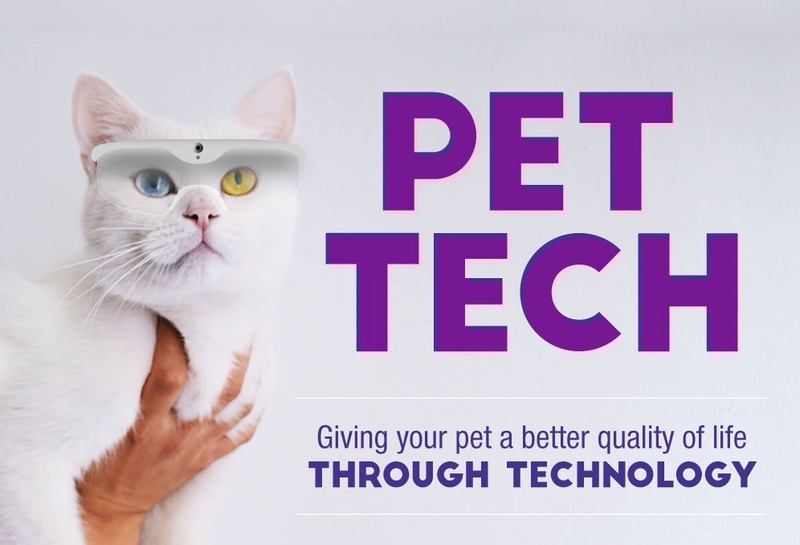 Give your pet a piece of the high tech pet tech future with some intuitive gadgets as detailed in this infographic.